1. Soak the muesli in the orange juice for 10 minutes. Put the soaked muesli with liquid, flour, sugar, yeast, spice, raisins and salt in a large bowl. Beat the egg with the melted butter and milk, then add to the bowl. Mix with a round-bladed knife to make a soft dough, adding a dash more milk if the dough feels dry. 2. Turn out onto a floured surface and knead for 10 minutes until the dough feels elastic. Transfer to a lightly oiled bowl, cover with clingfilm and leave to rise in a warm place for 1½-2 hours or until the dough has doubled in size. 3. Grease a large baking sheet. Turn the dough out onto a floured surface and cut into 10 pieces. Shape each into a ball and space 5cm apart on the baking sheet. Cover loosely with greased clingfilm and leave in a warm place for a further 45-60 minutes until doubled in size. Preheat the oven to 220°C, gas mark 7. 4. 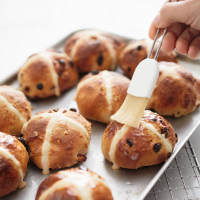 For the crosses, stir 5 tbsp cold water into the plain flour until no lumps remain. Spoon into one corner of a small plastic food bag and twist the ends to contain the mixture, or use a Cooks' Homebaking Piping Bag. Snip off the very tip and pipe crosses onto the buns. 5. Bake for about 12-15 minutes until risen and golden. Meanwhile, gently heat the milk and sugar in a small saucepan until the sugar dissolves. Bring to the boil and boil for 2 minutes. Brush over the buns while still warm then transfer to a wire rack to cool.